Q. Do I need the Connecticut Safe Waterskiing Endorsement? Have a valid boating certificate from Connecticut, or a state that has a reciprocal agreement with Connecticut, or have a US Coast Guard operator's license. Learn more about how to obtain your Connecticut boating certificate. Q. Are there exemptions to needing Connecticut Safe Waterskiing Endorsement? A. 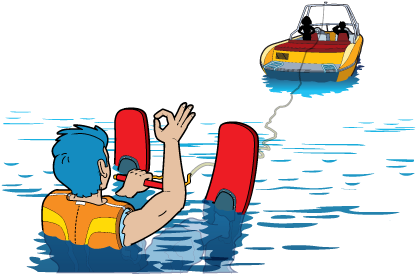 Persons who obtained their Connecticut Boating certificate prior to October 1, 2015 are exempt from the requirement to have a Connecticut Safe Waterskiing Endorsement. Q. What is a Conservation Identification Number and how do I get one? A. In order to register for this course, you will need to retrieve your endorsement from Online Sportsmen Licensing System (using your Conservation ID). If you don't have a Conservation ID number (or are not sure if you have one) go to the Online Sportsmen Licensing System and search the system using your driver's license or social security number. If you don't have an ID, you will be given the option to register as a New Customer. When registering, choose "Select Here to Receive Your Conservation ID Only for an Education Course Registration." Q. How much does the Connecticut Safe Waterskiing Endorsement Course cost? A. There is a one-time fee of $9.00 paid to BOATERexam.com. Payment is collected only after you have successfully passed the course and final exam, and includes unlimited attempts at the final exam. Learn more about BOATERexam.com's Risk-Free Policy. Q. What grade do I need to pass the exam? A. You need a grade of 80% or higher on the exam to pass the course. Q. Can I review my exam answers? A. Yes, once you have completed the exam and submitted all your answers they are graded immediately. You have the opportunity to review all your exam answers, whether you have passed or failed the exam. Q. Are there practice tests or sample exam questions available? A. Throughout the course, you can take end-of-chapter-quizzes that prepare you for the final exam. These chapter quizzes are short exam practice tests that cover the same topics that are present in the final exam.